Torsten Slok at DB sent along this lovely graph. 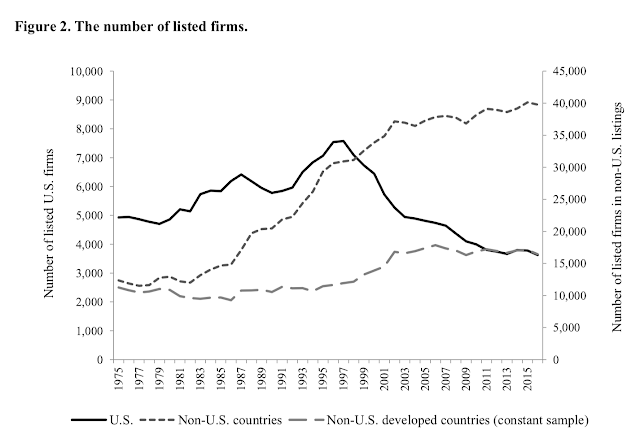 The underlying paper “Eclipse of the Public Corporation or Eclipse of the Public Markets?” by Craig Doidge, Kathleen M. Kahle, G. Andrew Karolyi, and René M. Stulz, has a lot more. Stocks are fleeing the exchanges in the US. 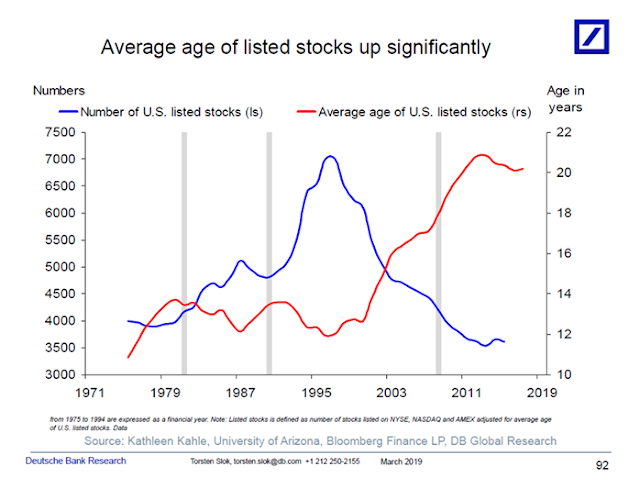 Small and young stocks are disappearing most, with older larger stocks dominating. Less public means more private, not less companies. Companies are more and more financed by private equity, groups of large investors, debt, venture capital and so forth. What’s going on? Doidge, Kahle, Karolyi, and Stulz have some intriguing hypotheses. 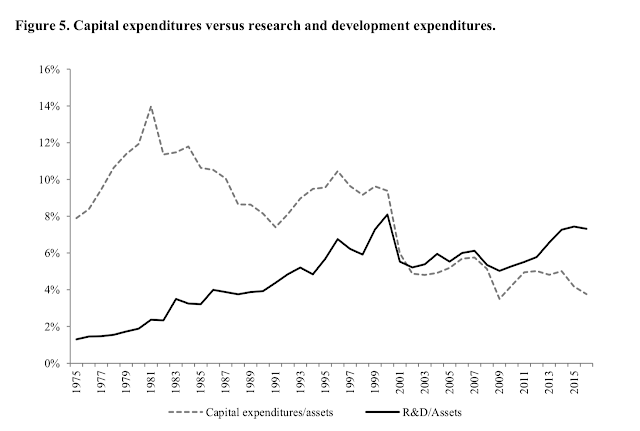 US business is more and more invested in intellectual capital rather than physical capital — software, organizational improvements, know-how, not blast furnaces. These, they speculate, are less well financed by issuing shares on the open market, and better by private owners and debt. This shift from physical investment to R&D — investment in intellectual capital — is an important story for many changes in the US economy. Improvements in financial technology such as derivatives allow companies to offload risks without the “agency costs” of equity, and then keep a narrower group of equity investors and more debt financing. I.e. the only reason to go public is for the founders to cash out, and to offer a basically bond-like security for investors. But not to raise capital. They leave out the obvious question — to what extent is this driven by regulation? Sarbanes Oxley, SEC, and other regulations and political interference make being a public company in the US a more and more costly, and dangerous, proposition. This helps to answer the question, why in the US. The move of young, entrepreneurial companies who need financing to grow to private markets, limited to small numbers of qualified investors, has all sorts of downsides. If you worry about inequality, regulations that only rich people may invest in non-traded stocks should look scandalous, however cloaked in consumer protection. But if you can only have 500 investors, they will have to be wealthy. Moving financing from equity to debt and derivatives does not look great from a financial stability point of view. Our financial system has become remarkably democratized in recent years. Once upon a time only wealthy individuals held stocks, and had access to the superior investment returns they provide. Now index funds, 4501(k) plans are open to everyone, and their pension funds. What will they invest in as listed equity disappears? A wealth tax, easy to assess on publicly traded stock and much harder to assess on private companies with complex share structures — especially structures designed to avoid the tax — will only exacerbate the problem. More moves to regulate the boards and activities of public companies will only exacerbate the problem.